Hotel Outside is a very cozy and sustainable hotel which is certified and honored with different eco-tourism awards like the Luxury Eco-Friendly Hotel Of The Year 2016 Award by Luxury Travel Guide. 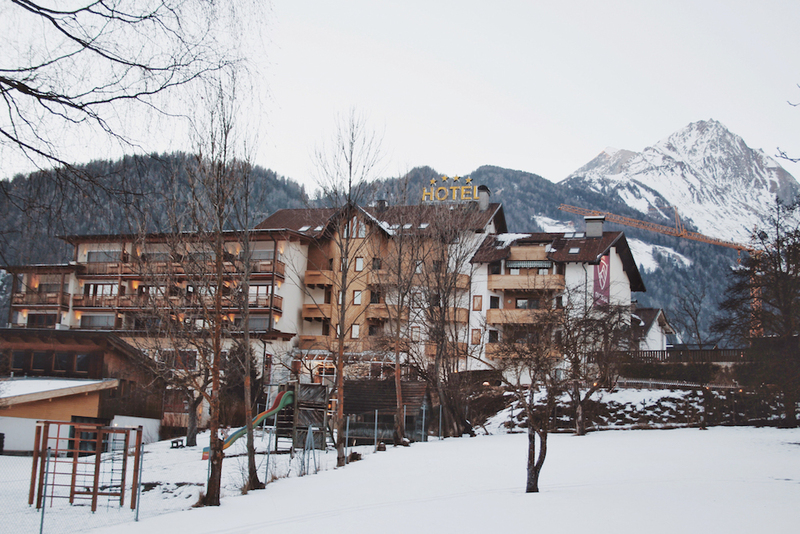 The hotel has been awarded by the Austrian Eco-label, European Eco-label and the Climate Alliance Tirol since summer 2015. 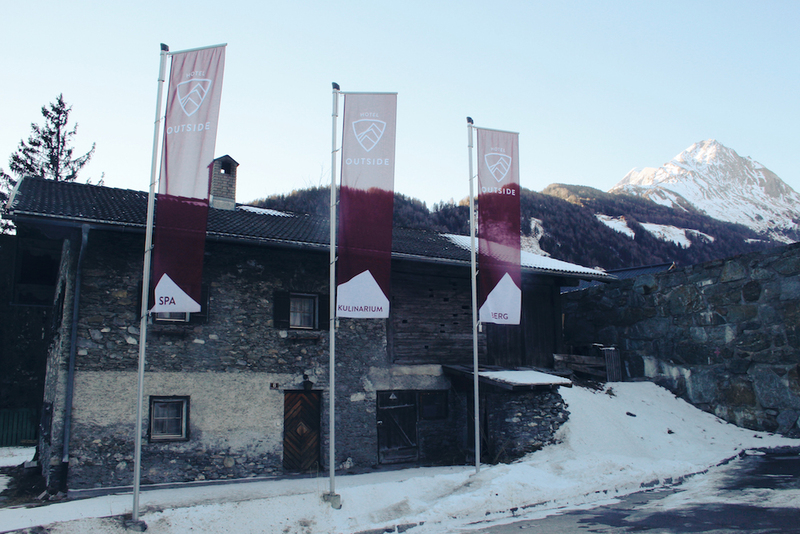 Hotel Outside is also a member of Hiking Hotels (Best Alpine Wanderhotels). 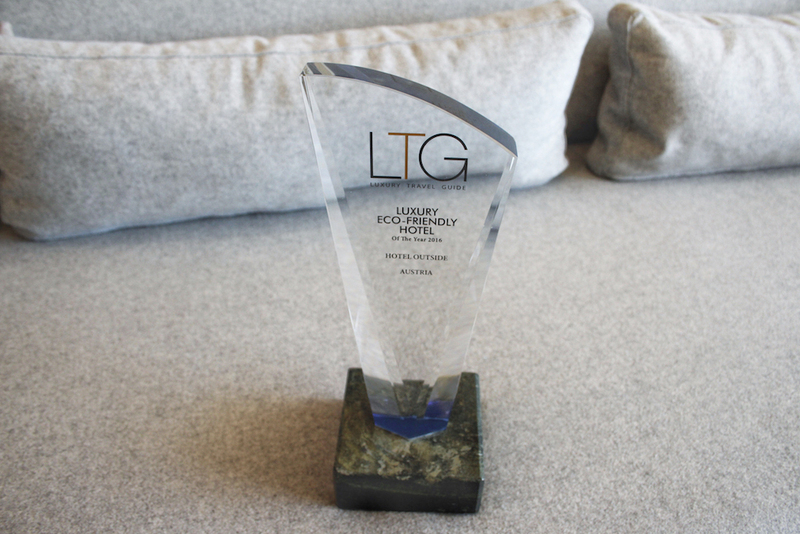 Luxury Eco-Friendly Hotel 2016 Award by Luxury Travel Guide. The comfort just started with the arrival, when we were picked up from the track in Lienz and our luggage was carried to the new Tesla car with falcon wing doors. We drove with the all-electric Tesla Model X about 30 minutes to Hotel Outside in Matrei in East Tirol. As we arrived we were welcomed by super friendly people and a cozy foyer. The foyer is designed with a modern interior made from natural and regional materials such as wood, stone, wool and leather. Eye-catching is the huge 300 years old trunk from 1725 which was felled in 2015 and is now hanging on the wall above the sofa corner. We arrived in the afternoon and started our stay with a welcome drink, a cup of hot organic herbal tea. 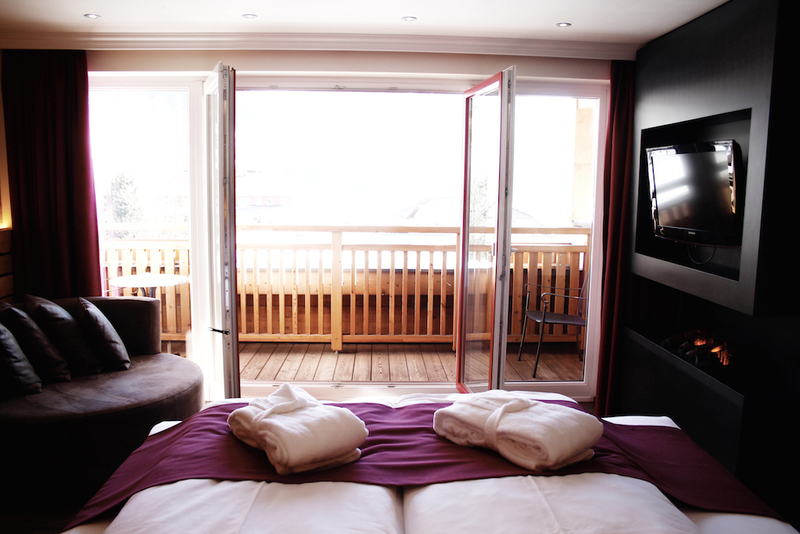 We were loving our huge Natur Suite equipped with a very cozy bed, a seating area, a table, and a huge balcony. 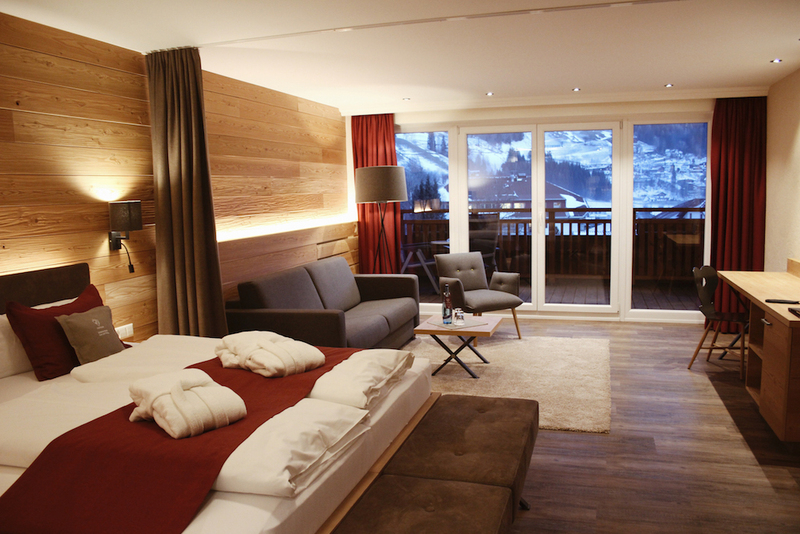 From the balcony, you have an amazing panoramic view onto the alps and the Nikolai church while inhaling the cleanest and freshest mountain air. 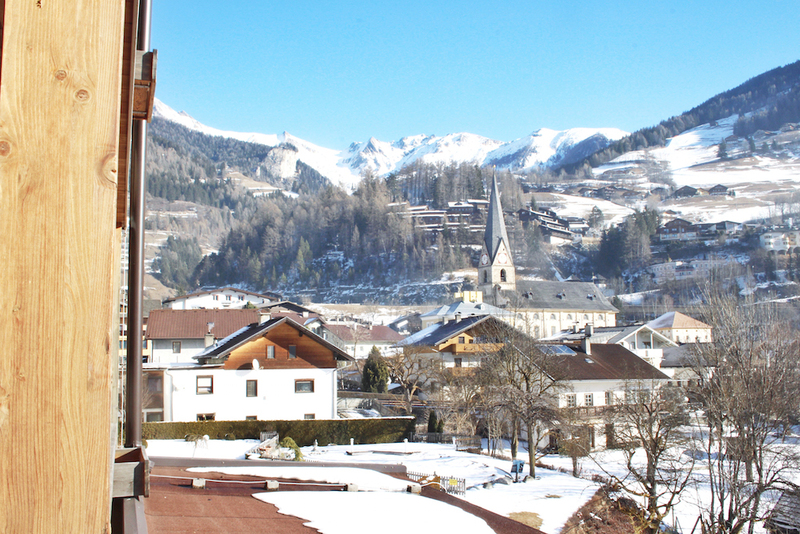 View form the Natur Suite balcony onto the alps. View form the Natur Suite balcony onto the Nikolai church. 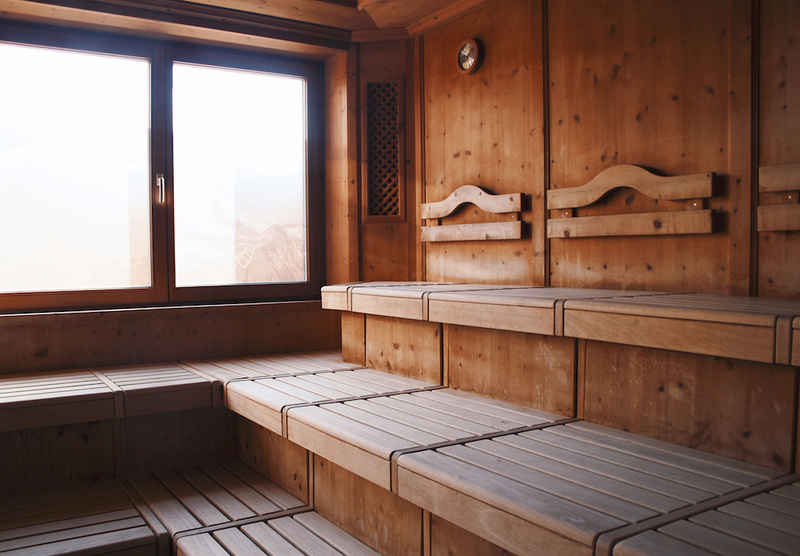 The Natur Suite is only designed with carefully selected organic materials from Austria. 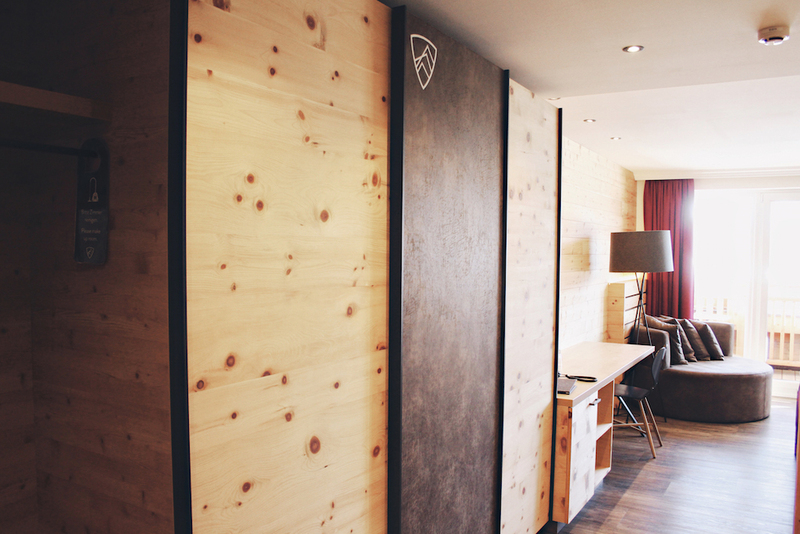 The walls are made from organic loam, which regulates the air moisture, saves warmth, and ties pollutants in the room. 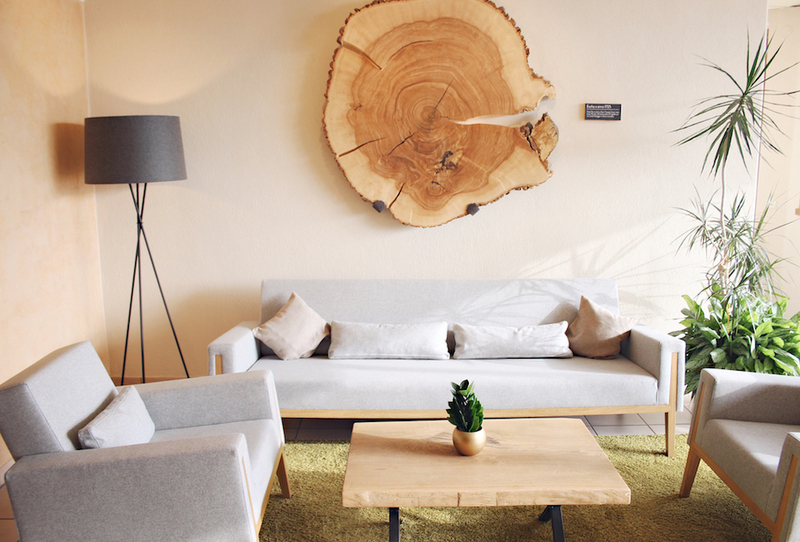 The sofa, lamps, and pillows are covered with organic wool. 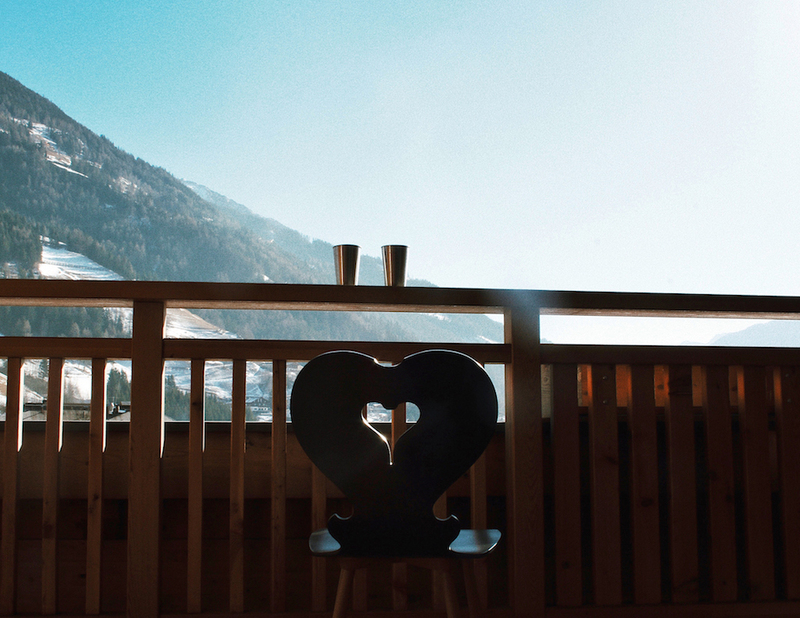 The wooden heart chair is hand made in Austria. 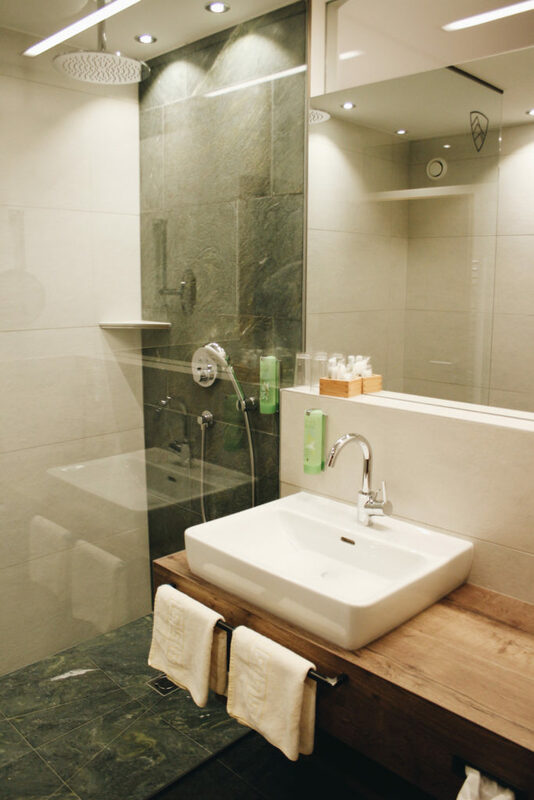 The shower and toilet are separated rooms. 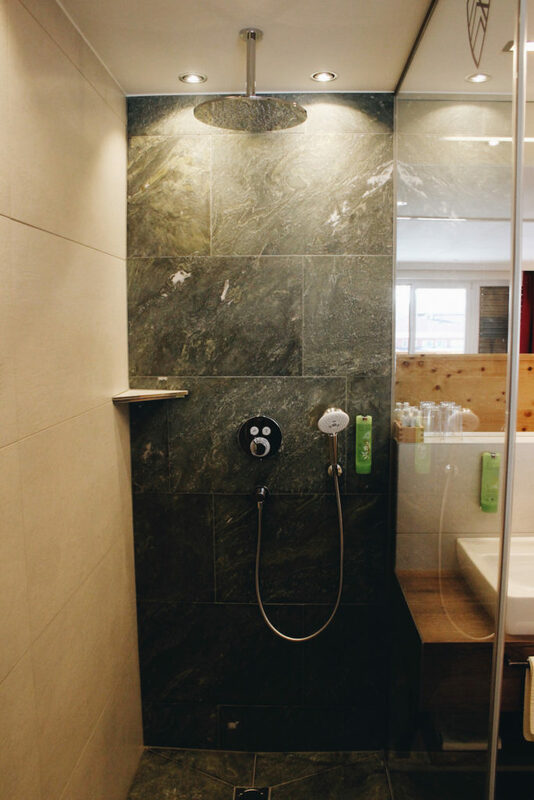 The wall and floor in the shower have been made from a beautiful organic green stone from a mountain in Tirol. You don´t need to bring shower wash because the hotel has its own certified organic body wash hanging on the wall. It is filled up regularly, so no need for packaging waste. The wooden closet is amazing. If you open the huge closet, which comes with a safe, and you stay in front of it, the light switches on automatically. As soon as you move away from the closet, the light turns off. 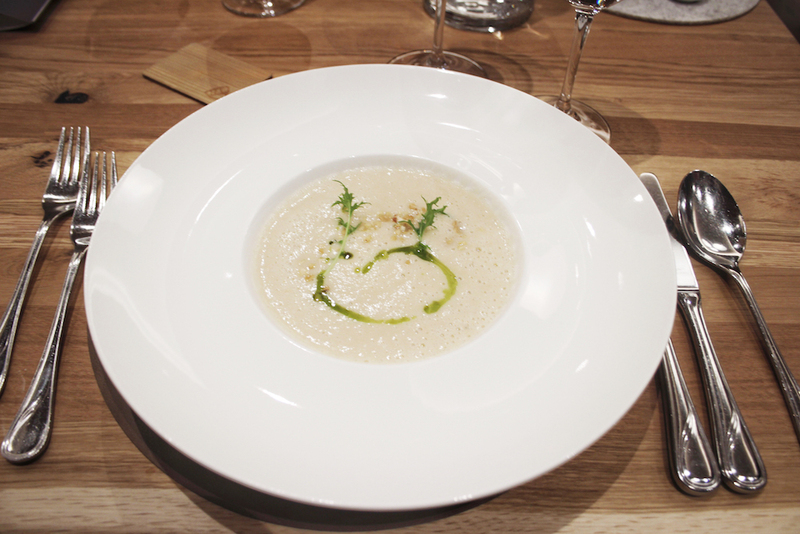 The food is very versatile and really delicious. 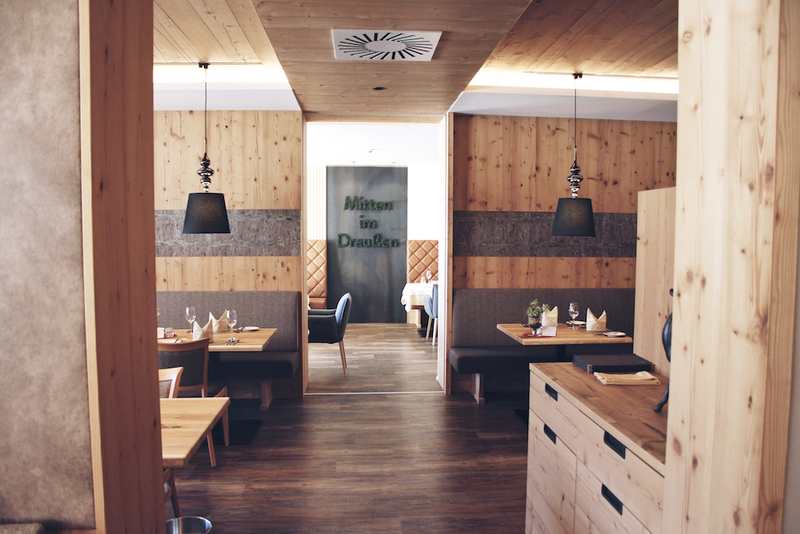 The kitchen only uses regional, seasonal and natural ingredients from Austria. 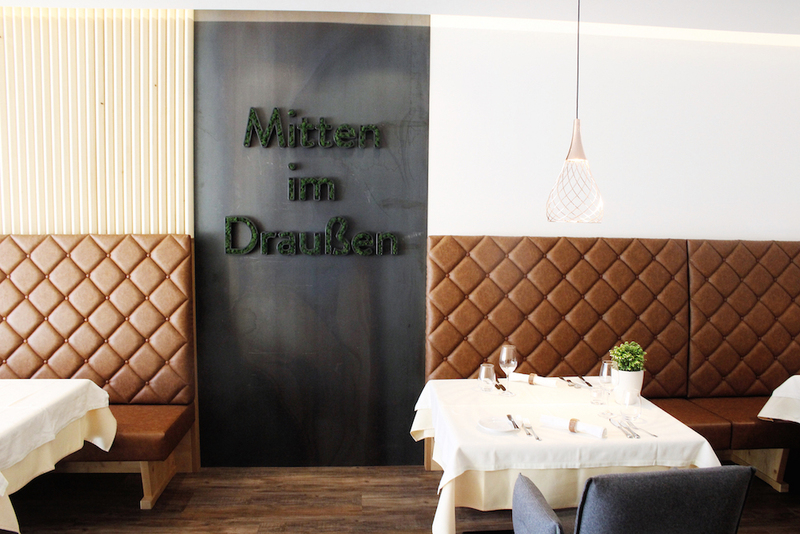 You get freshwater fish, meat from the Matrei hunter, and house-made dishes. 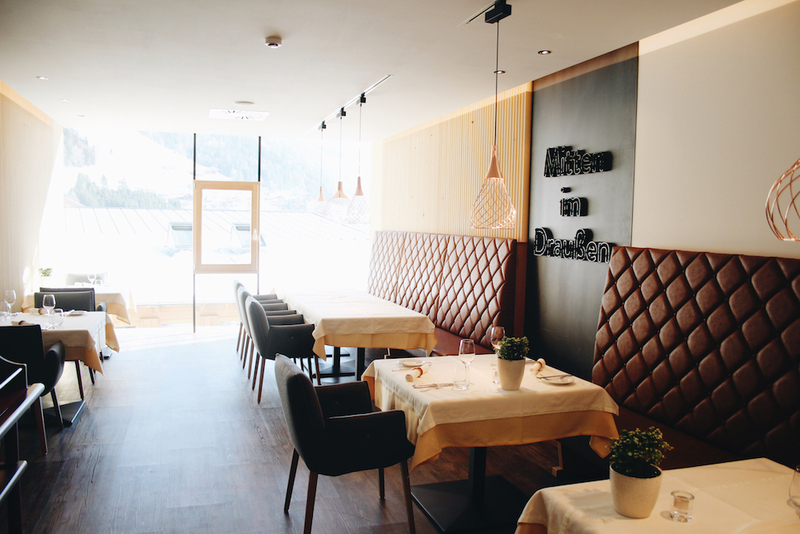 You can whether eat in the traditional restaurant or in the new à la card restaurant “Inside” both managed by chef Werner Wibmer. 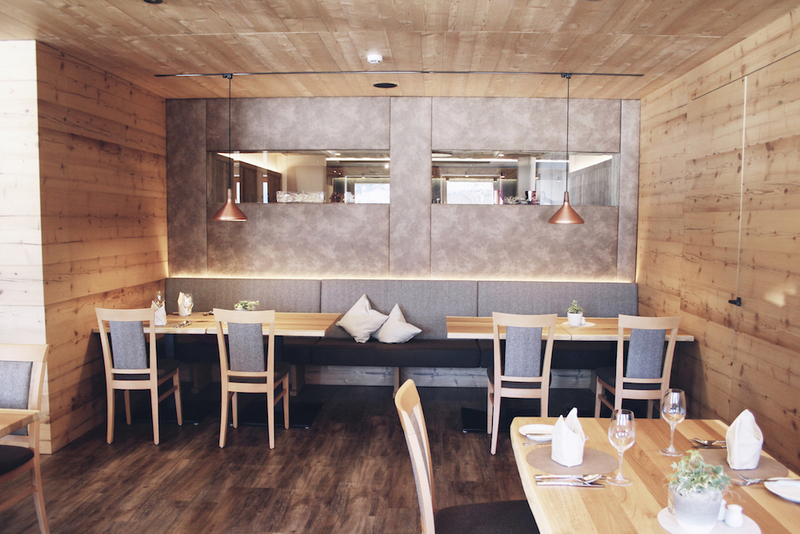 We got mouth watering dishes such as zander filet, vegetable strudel with stewed white cabbage and chervil pesto, homemade polenta ravioli with vegetables, cheese board. 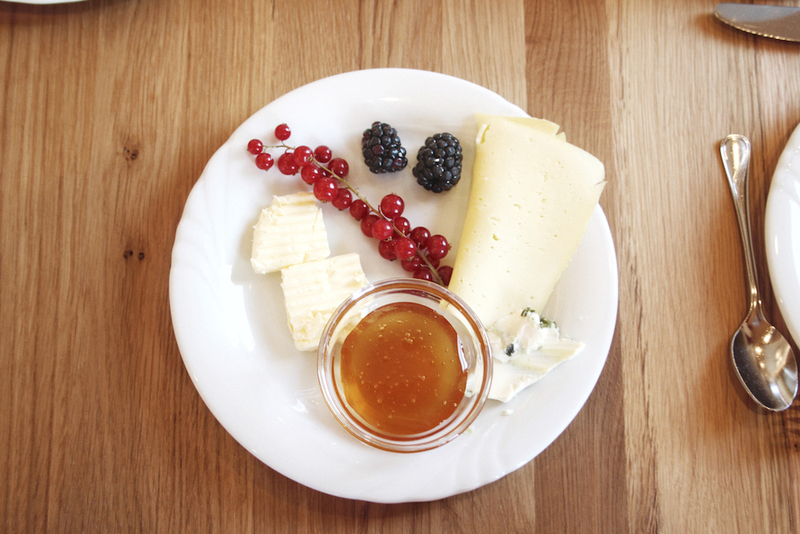 For dessert, we got Buchteln, Apfelradln, Ingsante Nigelen, Topfen-mousse, Tiramisu. Fun fact: The chef and his team also build a musician band and sometimes playing traditional live music after dinner. Hotel Outside à la card restaurant “Inside”. 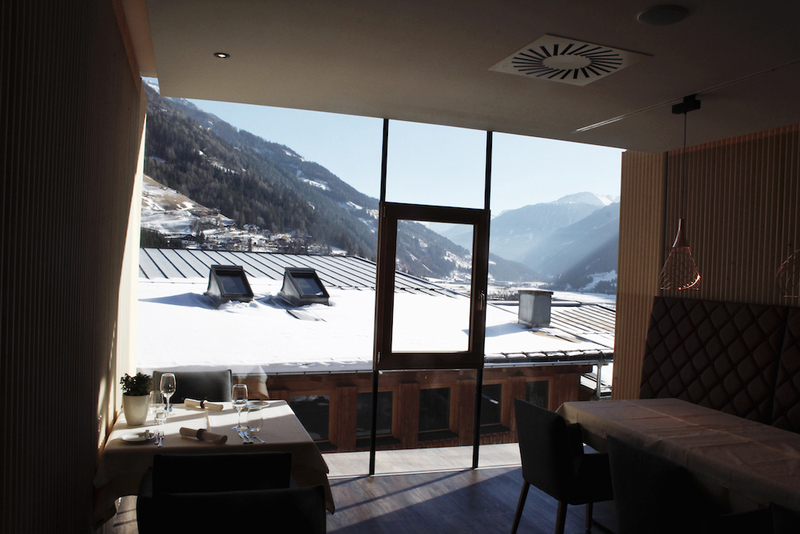 Panoramic view onto the mountains from à la card restaurant “Inside”. 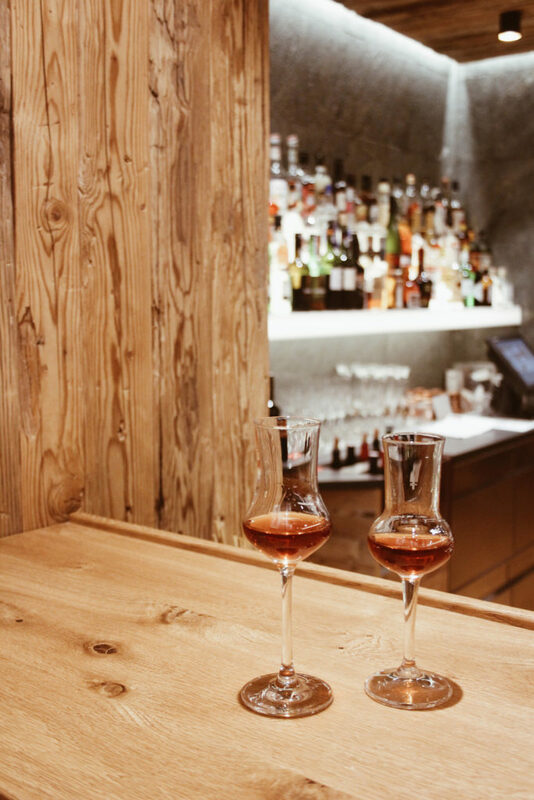 After dinner, we tried the delicious home-made Zirbe liquor at the bar while snacking dried bread chips (made from leftover breakfast bread). In the morning our table was lovely prepared with the Outside Express, which is a piece of paper with information about the daily weather, activity tips for the day, nutrition and relaxing tips, health facts, and some knowledge about natural local materials like Zirbenwood. 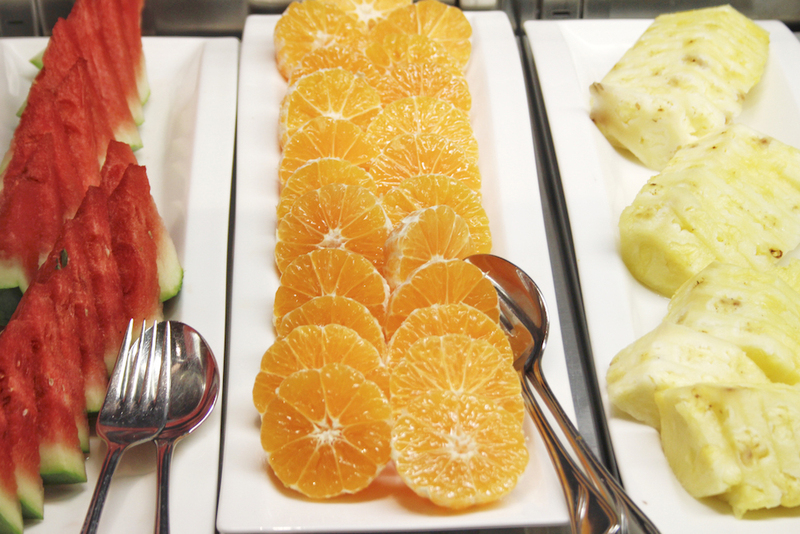 For breakfast, we could choose from the huge buffet and additionally pick some extras from the breakfast menu such as poached egg, TCM traditional Chinese medicine müsli or porridge. 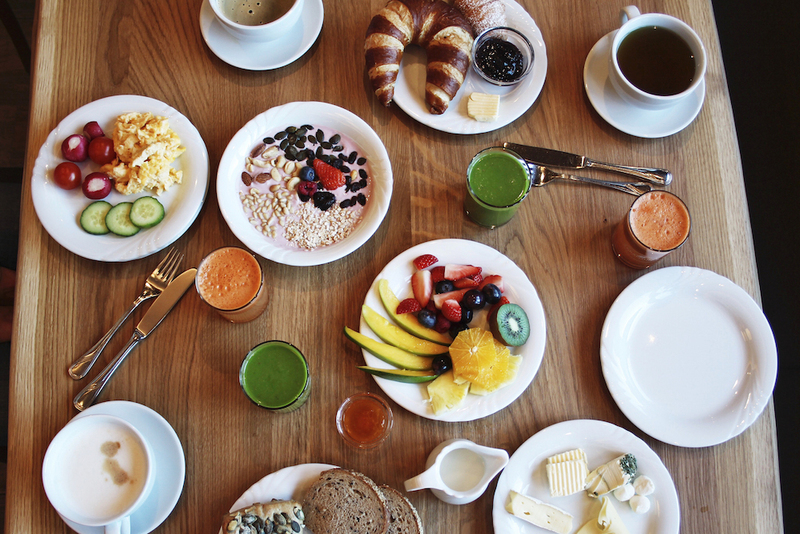 During the breakfast, we chose from the dinner card between different dishes which is really good for vegetarians as well. 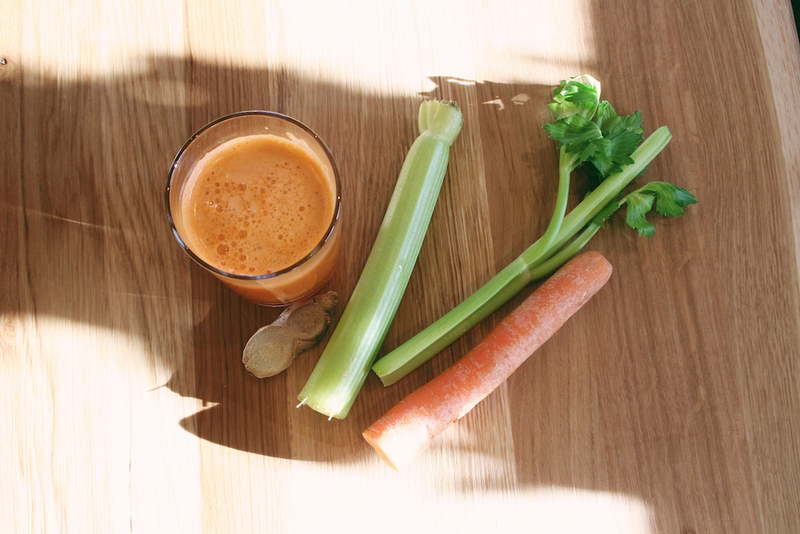 Fresh veggies for pressing your own juice. 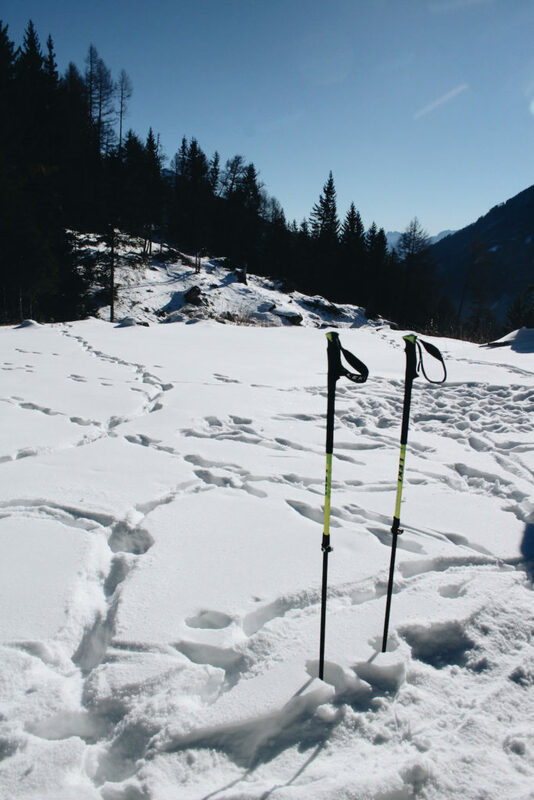 Guided snow trekking tour through the National Park Hohe Tauern. The diverse activity program is created by 4 outdoor specialists. Usually, you can find the weekly activity program hanging out in the foyer. 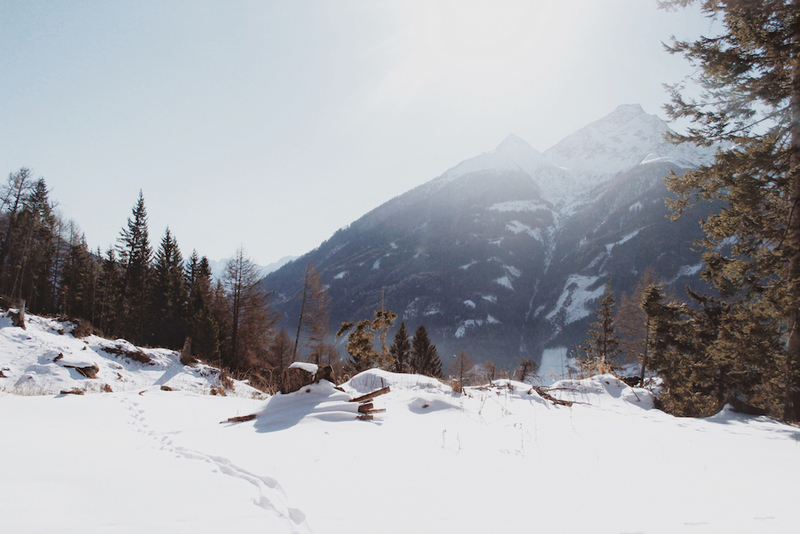 You can practice yoga in the morning, go skiing or go snow tracking in the National Park Hohe Tauern where you can discover the wilderness and nature of the Tirol alps and this is what we enjoyed. Eight months of the year are dominated by deep winter, while spring and autumn hardly take place at all. High mountain animals and plants are the best specialists in coping with stress. 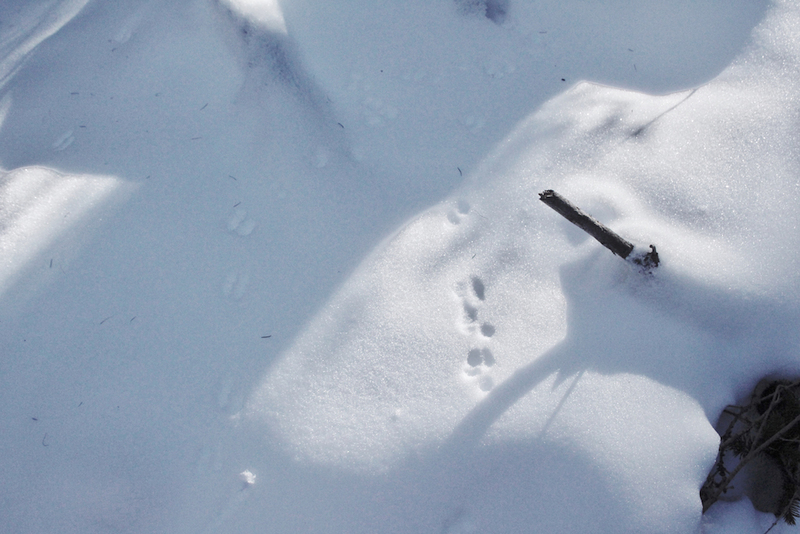 Wildlife tracks in National Park Hohe Tauern. 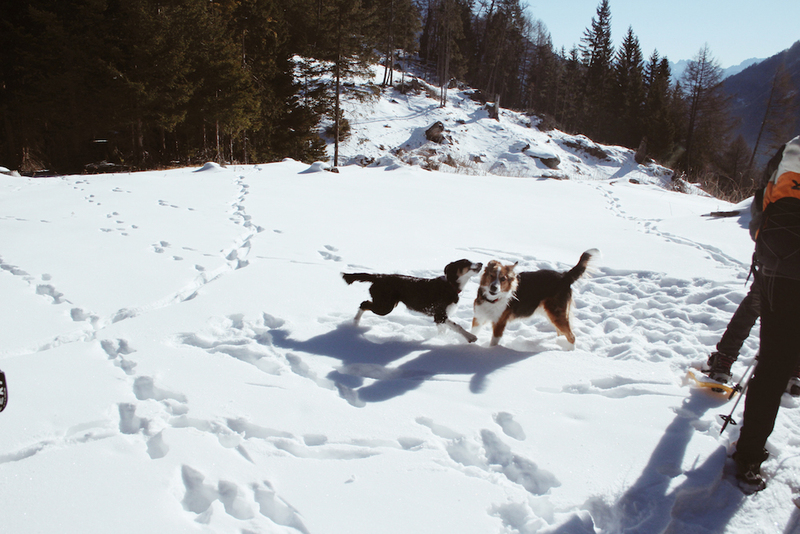 Dogs playing in snow in the National Park. 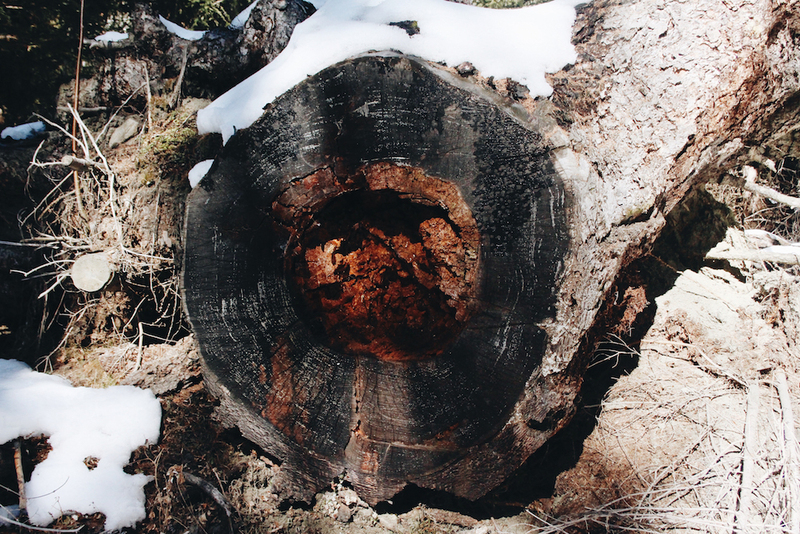 Over 200 years old tree trunk. In the afternoon, you can join a torch hike or take part in the hiking regulars´ table where you learn knowledge and tips around the mountains. 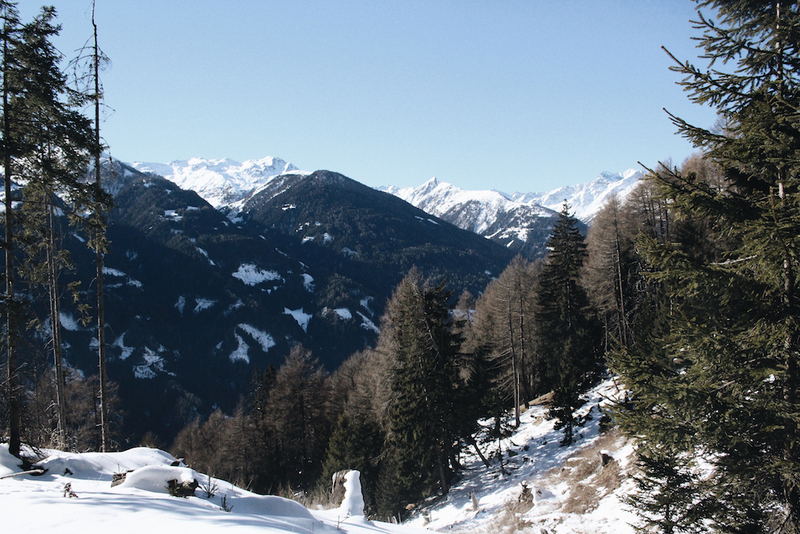 During summer, the Hotel Outside offers 3-5 guided hiking tours per week, which are free of charge. You can also borrow walking sticks and backpacks for free. 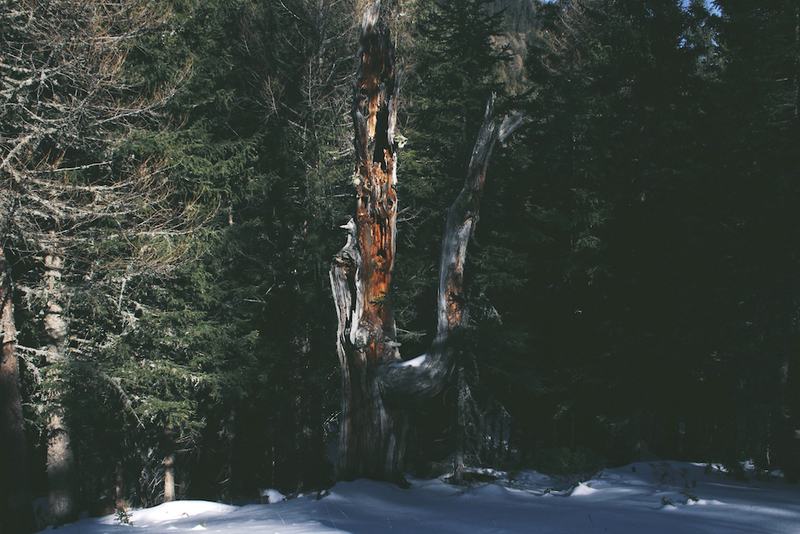 During the summertime, you can hike longer tours and even higher up the mountains. 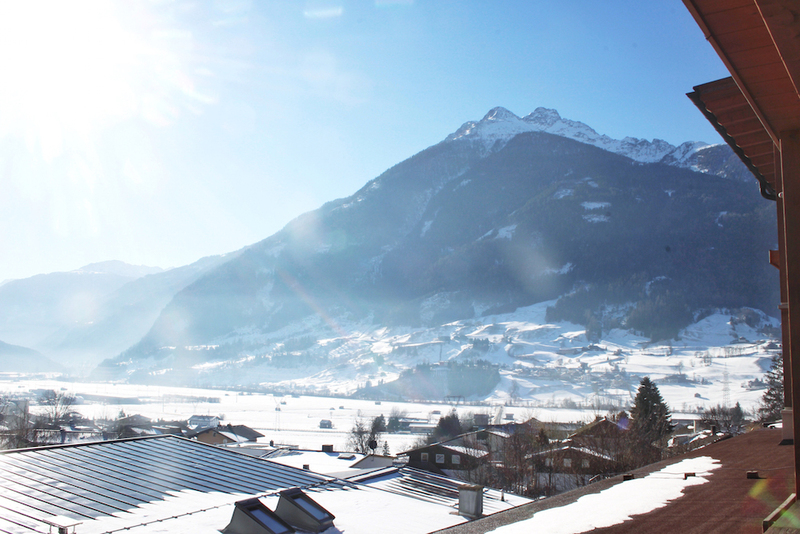 The tallest mountain is the Großglockner which 3798 meters high. 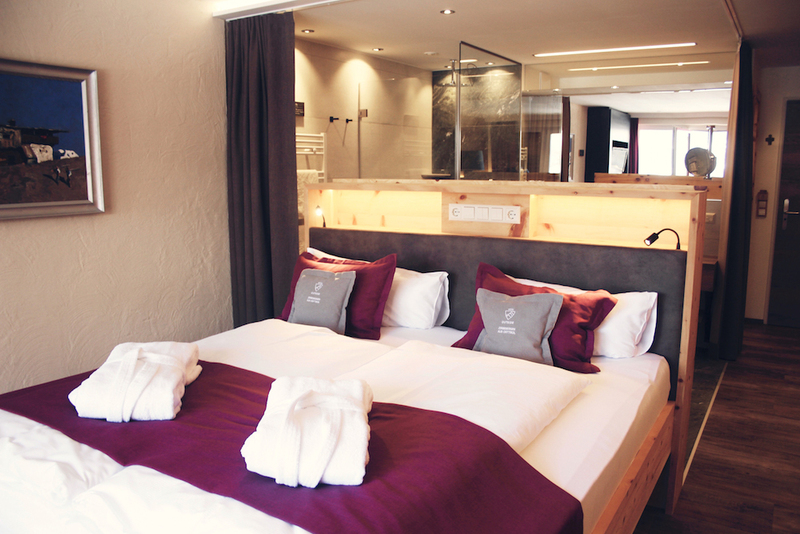 The hotel also books different external activities for you like tennis, climbing, riding, rafting, langlauf or soccer. If you have children they can stay at the children´s kindergarden. 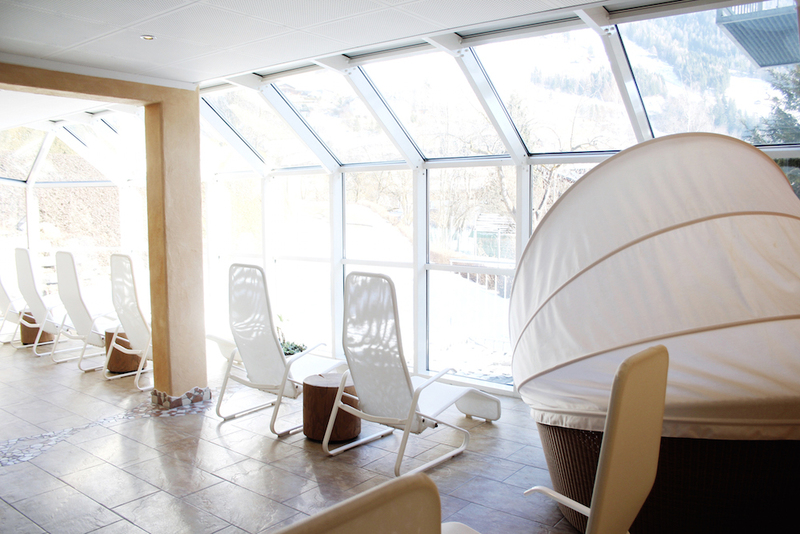 The perfect way to relax after a snowy day in the alps is to hang in the spa. We brought our spa bag, which we got in our room filled with slippers, a bathrobe, and 2 towels. We drove with the lift directly to the basement where the spa is located. The towels are renewed daily. 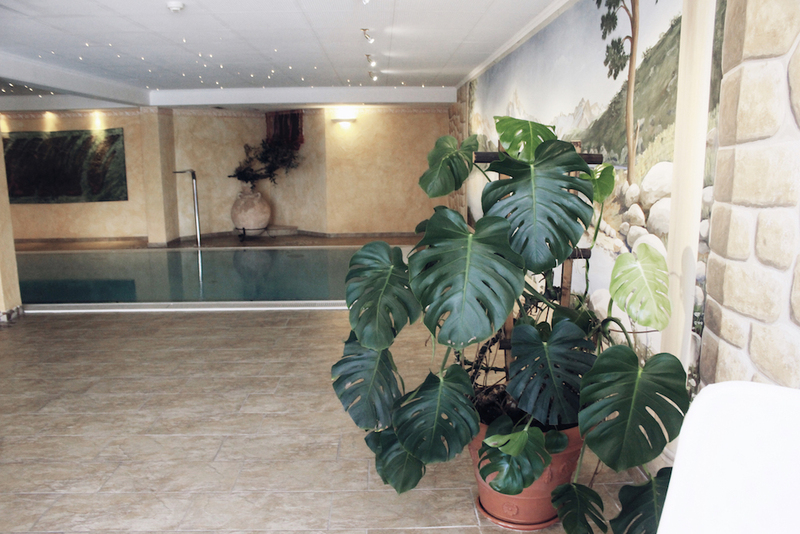 The spa has 4 different saunas (brine sauna, a hot stone pine sauna, an aroma steam sauna and an infrared sauna), a swimming pool, a tea bar and relaxing areas where we laid on comfy wellness chairs and enjoyed a good read with a cup of tea. If you prefer getting a massage, you can make an appointment at the reception. 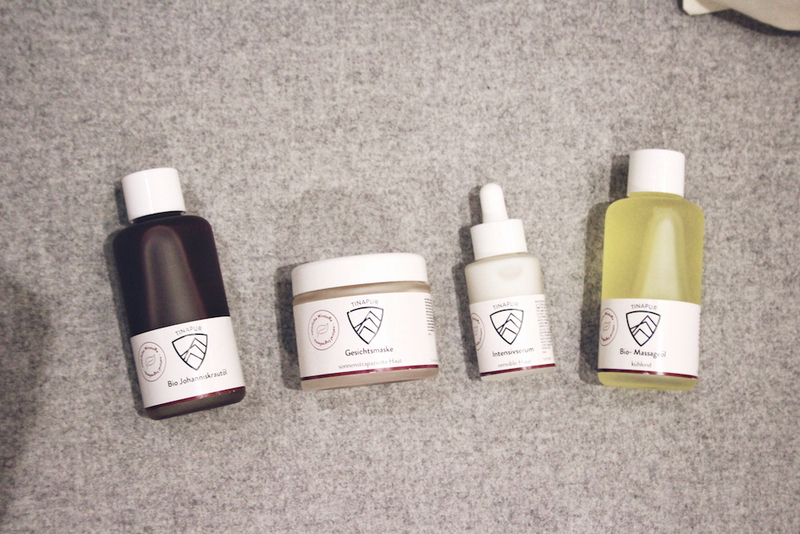 For cosmetic treatments, the Hotel only uses their own natural beauty line called TINAPUR made with certified organic ingredients from the region. The products have been created in collaboration with chem. Mag. Pharm. Stefan Pickl. 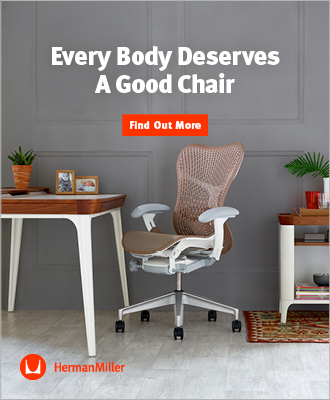 All products are also shoppable. 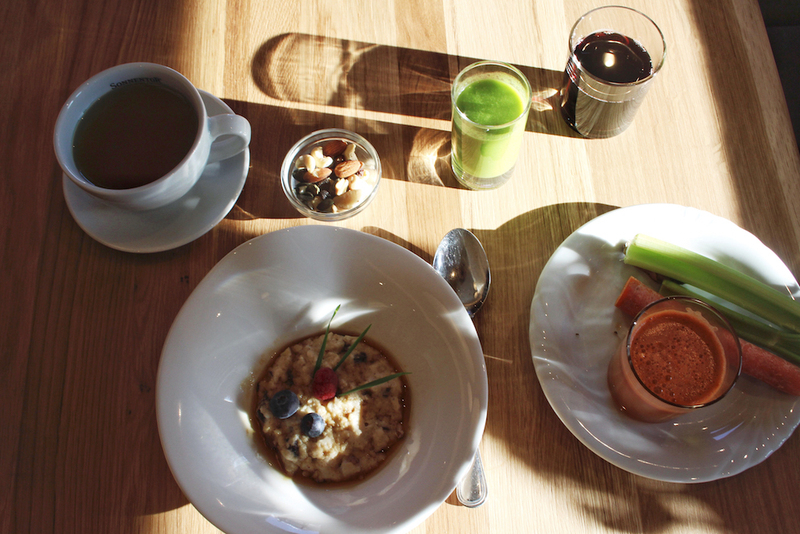 Hotel Outside´s own natural beauty products made with certified organic ingredients. All in all, we enjoyed ourselves a lot and loved our cozy stay at Hotel Outside. We would love to come back anytime. Thank you for the lovely hospitality Hotel Outside and thank you Green Pearls for the organization! Learn more about the Hotel and book your stay here: hotel-outside.com. In Partnership with Hotel Outside and Green Pearls.